Andy Kellett takes on the Wycombe defence. Photo by Gareth Williams. Wycombe Wanderers are hoping to bounce back from defeat in their trademark style on Saturday. Gareth Ainsworth’s side have lost twice in a row on only one occasion this season and their ability to quickly ‘stop the rot’ is one of the reasons they’re still in the promotion hunt. But Nick Tunney of the Bucks Free Press says Wycombe have been a bit of a mixed bag lately. 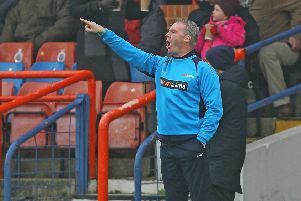 “They were on an eight-match unbeaten run before taking a hammering at home to Accrington last weekend,” he said. “During that run they were playing well, but not at their absolute, free-flowing best in some games. While Chesterfield started the season with promotion hopes and have suffered relegation, Wycombe are exceeding expectation. “They wanted the play-offs and that is now assured,” said Tunney. “But I think it would be disappointing if they didn’t go up automatically with the position they have found themselves in over recent weeks. Ainsworth has the luxury of being able to rely on a number of players in form. And he added to his squad in the January window. “Skipper Adam El-Abd has been an absolute rock at the back in recent weeks,” said Tunney. “He has been the standout player and is an exceptional captain. Nathan Tyson has looked a threat in recent weeks without finding the scoresheet too often and Marcus Bean has been a steady influence in front of the back four. “Tafari Moore, on loan from Arsenal, came in at right-back due to an injury to Michael Harriman and he has been very good in that role, although his own injury allowed Harriman to come back in. Likely line-up (4-3-3): Brown, Harriman, El-Abd, McGinley, Jacobson, Gape, O’Nien, Bloomfield, Tyson, Akinfenwa, Kashket.